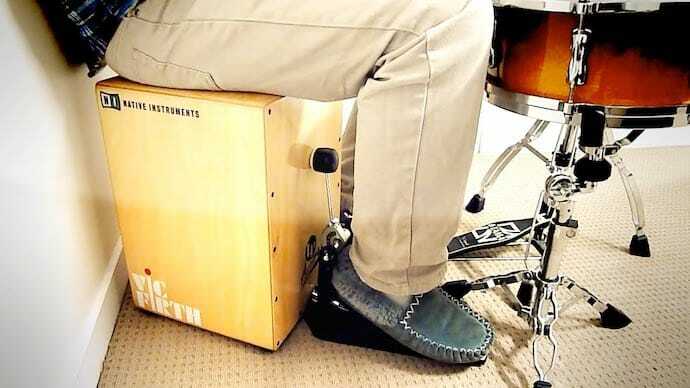 If you’ve never used a cajon pedal in your life, you don’t know what you’re missing. You may be the world’s best cajon slapper, but you still won’t be able to give your sound the depth of quality and natural feel that a cajon is capable of producing. Besides, if you ever thought about taking up drums as well, getting used to a pedal will surely help your cause. Meinl’s history and reputation in percussion instruments and accessories is well-known. This direct-drive cajon pedal is one of the more affordable models on the market. If you’re not an experienced player and if you’ve never used a cajon pedal before, this item won’t set you back much and it will serve as a good learning tool. Talking strictly performance, a direct drive will have some lag but the quality of the build in this case makes it barely noticeable. The design has also been made to work with all cajons, medium or large. 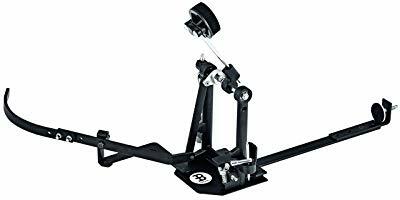 You also get good stability, which is highly important as the hit area is a lot smaller than that of a large kick drum. A most important feature is the beater. With this model, you get a soft beater which should help you achieve a clear bass tone with your cajon box. Somewhat mid-priced, the LD1500 is a personal favorite. The cable system is very quiet which makes the pedal very useful in acoustic jam sessions and practice. The beater is not very soft but produces a very unique sound. 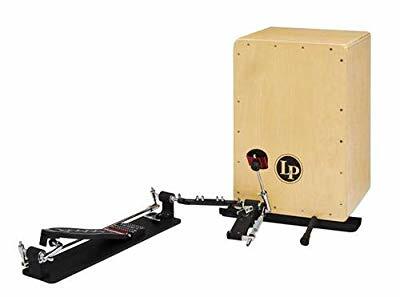 Latin Percussion is the only manufacturer that uses this type of beater, so if you’re looking to sound less generic when using a cajon, this might be one way to do it. Although typical direct-drive pedals aren’t as versatile, the LD1500 offers a lot of adjustability when it comes to spring tension. This should allow you to use your cajon to play a wide range of genres, from traditional Flamenco or Cuban rumba to fusion jazz and other more progressive or aggressive styles. 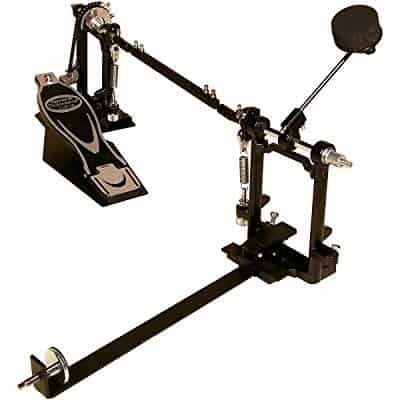 This pedal uses something called GlideTrack drive technology which has been proven to enhance the feel and feedback of bass drum pedals. Using this pedal certainly makes playing the cajon feel less rustic. The price is quite high. However, you are getting a level of quality and performance that is hard to match. The pedal action seems effortless and if you’ve been looking hard to find a pedal that can handle speed, this model might be right up your alley. It also comes with additional linkage lengths, which adds to its versatility, thereby making it one of the best cajon pedals around. And, if you’re a traveling musician, the quality carry bag should also be a plus. I was most pleasantly surprised to see such a rugged pedal made just for playing a cajon box. Don’t let the soft foam beater fool you, or the sleek appearance. This chain-driven pedal is as sturdy and stable as they come. And because of its cradle mount, it can be used on almost any cajon. Obviously, the chain-drive is the main selling point. 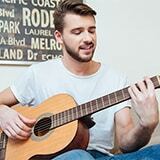 It eliminates any lag and allows you to play natural sounding rhythms with ease. The adjustable spring tension is also a big plus, as it lets you adjust the range of the beater to better suit different music genres. Last but not least, the carry bag is always nice to have as it allows you to hit the road as soon as you get the pedal. If you want to look like a drummer even though you’re playing on a cajon box, then this DG De Gregorio cajon pedal is one way to do it. It has a long but adjustable metal bar that connects the foot platform to the beater. In terms of aesthetics, it rather resembles a double bass pedal. And, because of its design, you will be able to play other instruments, including a secondary cajon drum, a lot more easily. 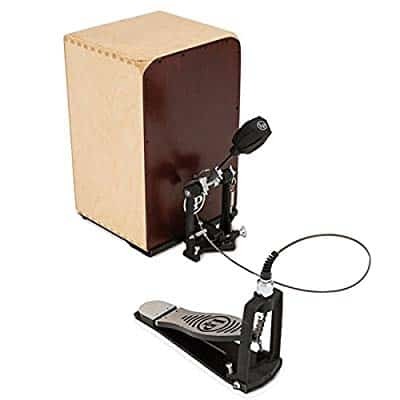 That’s because you can sit on one cajon box while using this pedal to fill the bass line on the other box. Although it comes with a hefty price tag, it’s not the most expensive model you can get your hands on. And it’s certainly a lot more versatile and durable than some competitor models. Is it the easiest to carry around from gig to gig? – Perhaps not. But if you’re all about playing comfort and sound quality, you’ll be hard-pressed to find something better. If you don't have any drumming experience at all then you might not know what makes these two types of pedals different. Apart from how they look and how they’re built, there’s only one good reason to choose one over the other. It comes down to feedback. Chain-drive pedals don’t have any lag while direct-drive pedals may be somewhat slower and harder to control. Or, at the very least, harder to adjust at times. 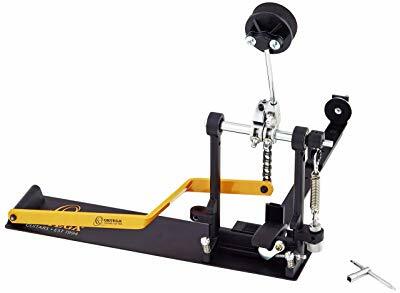 I prefer chain-drive pedals myself but perhaps you’ll feel more satisfied if you’re able to make some adjustments while also maintaining a quieter operation. This is something very interesting. While bass drum pedals all seem to look alike, cajon pedals are a bit different. Some of them are designed to work with a single box in the sense that they limit your reach. Now, if you’re an aspiring cajon player that wants to wow the audience, you’re probably considering using your other foot and your hands to play more instruments. Often times, another cajon box can do the trick. In order for this to work, you’ll want to get a cajon pedal that offers a lot of reach. Look for cajon pedals that transfer the energy from the foot platform to the beater through a rotating metal bar. This is a lot better than depending on a longer cable to do the work. This way you can make the most out of two cajon boxes. You can set them close together and not have to worry about stage arrangements. And you don’t have to worry about lag either. It doesn’t hurt if you look good while playing a cajon. A lot of people still aren’t as familiar with it as they are bongos, even though this instrument has been around for hundreds of years. One way to impress people and add depth to your music is to use accessories. While mallets and sticks are always fun, nothing gives as much depth as a cajon pedal. That’s the only way you can truly emulate a bass drum sound. Whether you’re just playing acoustic gigs, practicing for yourself, or on the road all the time as a professional cajon player, getting the best cajon pedal you can afford will definitely help improve your style.